The Purpose of F4 Corporate and Business Law is to create awareness and to develop knowledge and skills in the understanding of the general legal framework quite specifically areas relating to Contract, Company Law, Tort, Employment laws, Corporate Governance as these are some aspects of the law that will be faced by an individual in the practical field. It will ensure that the person has relevant if not expert knowledge of the law so that when the time comes he / she can make the correct decisions for himself or the company he is employed with and engage in meaningful conversation with the lawyer so as to reach a fair solution. By the end of ACCA F4 students not only gain the evidence that he or she can understand business English but also get a good idea of how the rule of courts, legal system and lawyers. In addition to this students have great insight into how corporations work in legal systems and everything associated with them in legal framework. 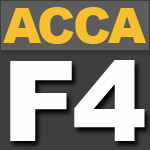 Access FREE ACCA – F4 video lectures exclusively available on this website. These video lectures give you all the tips, tricks and guidance to top your F4 syllabus and pass the exam with great confidence. Access FREE ACCA – F4 Revision Notes exclusively designed to memorize and grab key areas of ACCA – F4 syllabus. These ACCA F4 notes can work with any official study text book. Access FREE ACCA – F4 Practice questions. As past papers for ACCA – F4 are not available these practice questions can help in great to deal to practice different concepts examinable in ACCA – F4 course. Access FREE ACCA – F4 Mock Exams. These free mock exams enable you to check, test, stress yourself in every possible way so that you enter exam hall confident. These mock exams come in MCQs format and also include other types of questions. Learn what tips, tricks and topics you must have studied before you sit for an exam. These exam tips specifically details important areas of ACCA – F4 course.